This is the brief history of the development of Golden Circle Creaming Soda soft drink (soda). Supplies in for watching the World Cup 2018. What could be more blissful than an icy-cold Golden Circle Creaming Soda?. Photo courtesy of Lizzy F-J from MBC. There is 8kg of sugar in these eight cartons. Bliss. Taken at the Golden Circle Shop at Capalaba, Brisbane. Peter Seale asked me to develop the new drink for Golden Circle. 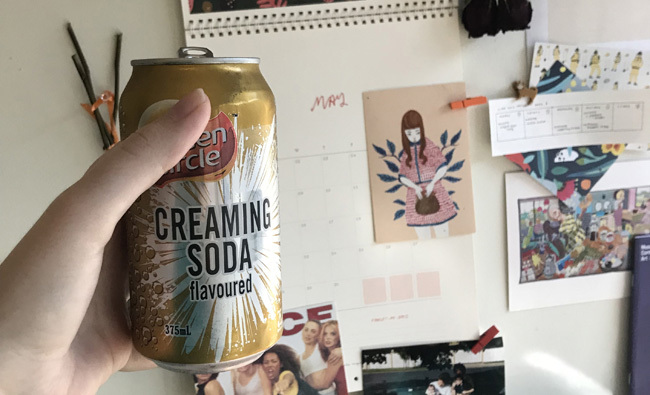 The two leading brands of Creaming Soda in Brisbane in 1969 were Kirks - from their factory at Milton, and Tristrams from West End. The other soft drink manufacturer in Brisbane was Horitz at Wooloongabba but I don't think they made a creaming soda. I used to buy crates of the drinks from the local greengrocer at Northgate and taste them to try and work out the particular flavours they used. It was hard and I tasted dozens upon dozens of bottles trying to get it right. I was pretty sure the two flavours being used were "Vanilla" and "Fruity". 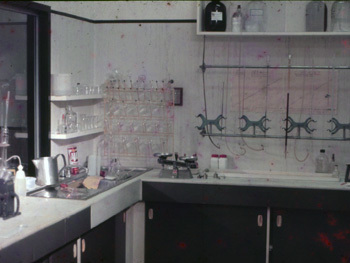 In the bottler lab I had hundreds of sample bottles of different flavours and the ones we settled on were Vanilla - manufactured by Nararden, and Fruity - manufactured by Bush, Boake & Allen. I made up a 11.5% sugar solution with a fairly low citric acid concentration (0.15% - about 1/10 of the acidity of the other soft drinks) but with no sodium citrate buffer. 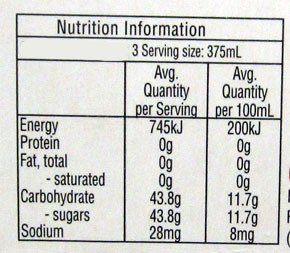 Sodium citrate was used in all other Golden Circle soft drinks but its salty taste would have been noticable in such a drink. To this I added the two flavours in different ratios. Every morning the Managing Director (John Brown) and Chief Chemist (Peter Seale) would come to the lab and taste the dozen or so samples I had prepared. They would tell me which one tasted the best and gave me instructions about changes to make. After about two months we had the final recipe. The sales team decided that the best colour would be yellow - to distinguish it from Tristrams and Kirks which were pink. So I used Tartrazine powder to give it a golden colour and made it up in softened water. It was also decided to make the drink "clear" as distinct from "cloudy". Golden Circle had perfected a process to extract oil from the skins of oranges and lemons which involved cenrtifuging the oil from the pulp and then emulsifying it. It gave drinks a slightly cloudy appearance which was desirable in "natural" drinks like orange, lemon and lime - but not in creaming soda. 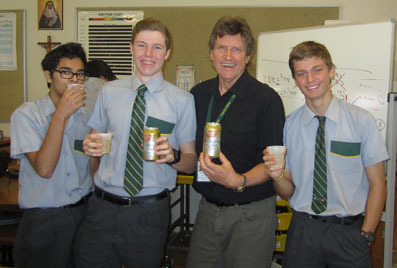 The carbonation and preservative (sodium benzoate) were decided and the drink went in to production. It ended up with a pH of about 3.8 (which was quite high for a fruit drink given that lemonade was 3.4, and ginger ale 2.7). However, instead of using straight cane sugar (sucrose) as the sweetener Golden Circle used some deionized apple juice (fructose) instead. 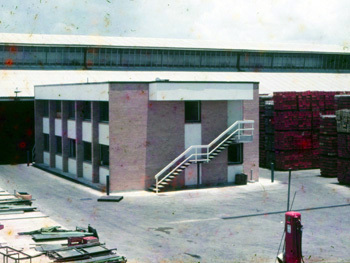 In the late 1960s, the Queensland government offered an incentive to food manufacturing companies if they used citrus products. If you made your drink with 5% Australian fruit juice then you were not required to pay any sales tax. Apple juice was sweet but couldn't be used in soft drink as the apple flavour imparted a strong apple flavour. 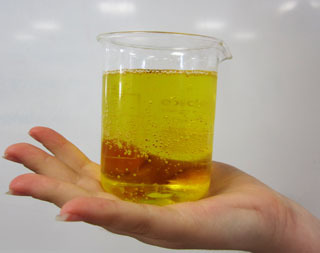 Cordial manufacturer Cottees had perfected a method a stripping the ionic content out of apple juice by passing it over an ion exchange resin. Golden Circle introduced the process while I was there in 1969 and deionized (or denatured) apple juice went into most of the soft drink and cordial products. All these years later the drink is still made to the same formulation - although I'm not sure if apple juice is still added. Firstly, you have to make the syrup. To make 1600 L of syrup you mix 1000 kg white sugar with 500 L denatured apple juice (10% fructose) and add 5 kg sodium benzoate (E211) dissolved in 25 L warm water, and 12 kg anhydrous citric acid (E330) also dissolved in warm water. To the syrup, 1 kg of mixed vanilla/fruity essence is added, 800 g Tartrazine powder (E102) paste, and treated (softened) water is added to make the volume up to 1600 L. When it is being bottled water is added to the syrup in the ratio of 5:1 and it is carbonated with 4 L of CO2 to every 1 L of beverage. 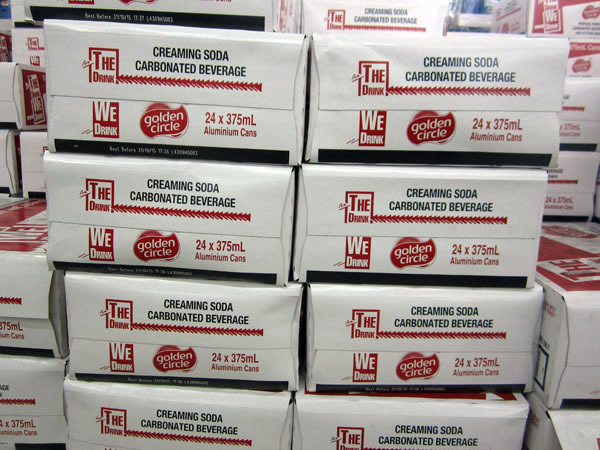 You end up with 10000 L of Creaming Soda. Also in the late 1960s Golden Circle was making and bottling Pepsi Cola for Pepsico (UK). As the bottler chemist I had to work out the formulation for the concentrate that the plant would use in preparing the drink. The levels of sugar, citric acid and phosphoric acid were not a secret, but the flavour came in aluminium bottles from London. We didn't know the ingredients but just used the prescribed amount to make the Pepsi. It had a pH of a very low 2.2 thanks to the citric and phosphoric acid. Every month I would send samples of the softened water to London for checking. Pepsi pulled out of the bottling arangement and Golden Circle decided to make their own cola based on the flavour of Coca Cola. It was too hard to copy no matter how hard they tried. Eventually they came up with a cola that people liked. It was tested on apprentices in the factory who said they preferred it to Coke, but at lunch time they would always buy Coke at the shop and never Golden Circle Cola. 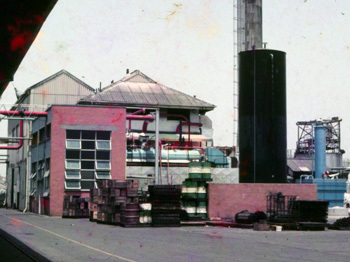 Some photos I took at the factory in 1969. The Quality Control laboratory in the soft drink factory. Note the burettes. I spent 8 happy months here. The Research Laboratory. The ground floor was for general research and the top floor was for work on pineapple growing. The hydrogen ion exchange unit (HI Unit) used for softening water. 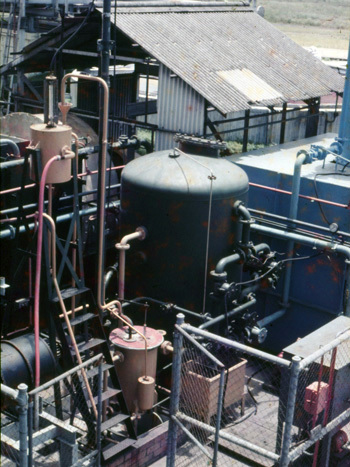 The big green tank was full of an ion exchange resin which removed ions from the town water in order to soften it. Once the resin was exhausted it was recharged by backwashing it with sulfuric acid. My job was to test the water and to acid wash the resin. Inside the main factory. High pressure steam passed through the stainless-steel pipes. One of my jobs was to keep an eye on the charts (the two circular chart recorders shown). I spent a few months at the quality control lab in the canning section. The steam plant. 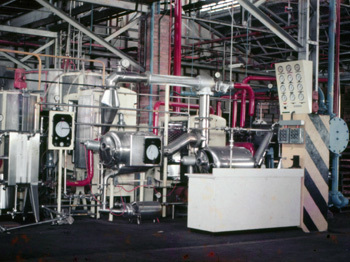 Here, an oil-fired boiler kept up a steady flow of steam for the factory to ensure all canned foods were sterilized for the right time and temperature. The HI Unit was behind the black water tower to the right. I had to get a daily sample of water to test. 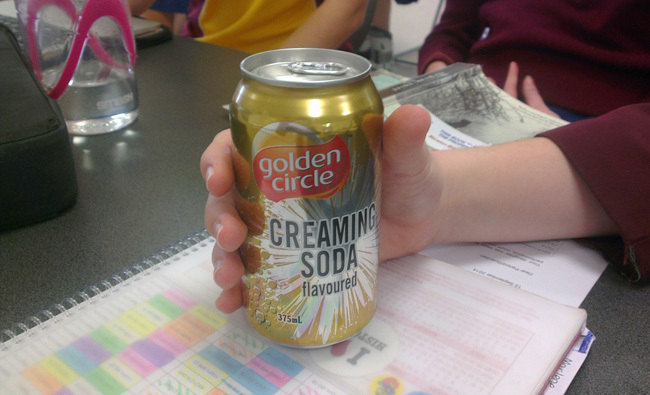 Golden Circle Creaming Soda - a pH of 3.83. Just perfect. My thanks to Stella in my Year 10 Technology and Applied Science class at Moreton Bay College for doing the pHs. Kirks Creaming Soda is for the less sophisticated palate. It has a lower pH to hide the awful taste. Stella helped me out yet again. I think she will become a chemist. 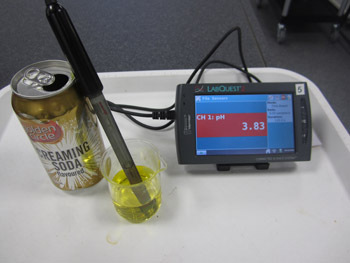 The titratable acidity (TA) of Golden Circle Creaming Soda can be measured using phenolphthalein as an indicator (as above). A 20mL aliquot of the degassed drink gave a titre of 3.63 mL against 0.105 M NaOH. The TA works out to 0.38 mmol NaOH which is equivalent to 0.00635 M citric acid, or 1.22 g/L (0.122% citric acid). My thanks to Sophie for modelling the end point. Interestingly enough, Kirks uses an E163 food colouring (anthocyanins) which is derived from red grapes. 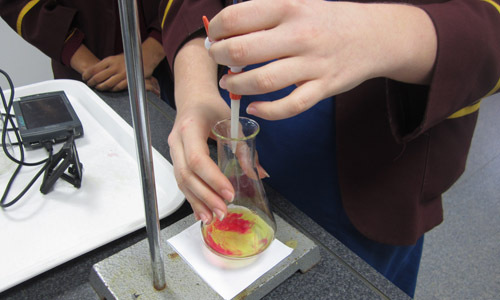 It is pH sensitive and changes colour on the addition of acid or base. You have to use a pH meter to detect the end point. I chose pH 7.0 as the end point as it is almost the same as for phenolphthalein. The TA of Kirks Creaming Soda is about the same as for Golden Circle. It is all the same teeth-decaying rot-gut really. You can even drink it out of beakers. A birthday party at Our Lady's College. Note the golden yellow colour. 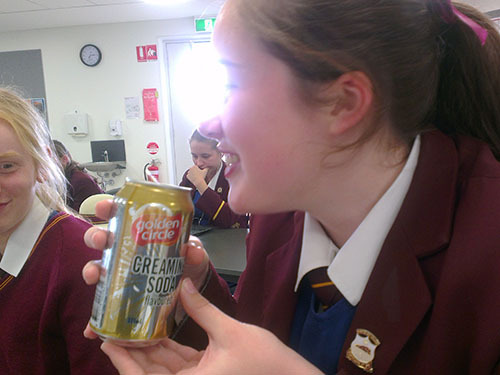 Olivia Nash says "This is my favourite drink". 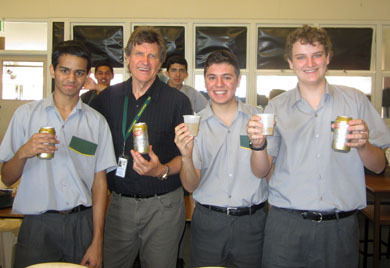 With more of my Year 11 Chemistry students. They loved the stuff. 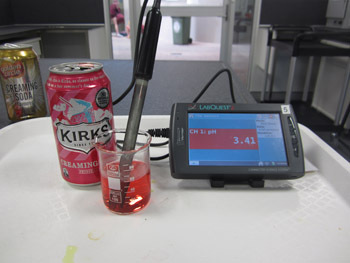 For chemistry experiments on soft drink, go to my soft drink investigations webpage and search for "soft drink".